Andrew is Morningside’s Associate Director. 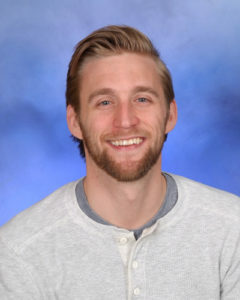 He has been training teachers for Morningside Teachers’ Academy for four years in elementary schools in Hawaii and has trained and coached education professionals visiting Morningside for the Summer School Institute in 2015 and 2016. Andrew oversaw the implementation of the Morningside Model of Generative Instruction at Haugland Learning Center in Columbus, Ohio, where he served as director from 2010-2014. This was the first successful replication of the Morningside Model of Generative Instructions with students diagnosed with Autism Spectrum Disorders. He received his B.A. in Public Affairs Journalism from The Ohio State University in 2007 but after a summer at Morningside’s Summer School Institute, turned towards Generative Instruction. He first started teaching middle school ASD but quickly expanded to working with a wide array of K-12 students. He spent two more summers studying and coaching at Morningside while training dozens of teachers and education professionals in the Implementation of the Morningside Model of Generative Instruction for students with Autism Spectrum Disorders in Ohio. Andrew completed his Master’s degree in Behavior Analysis at the University of North Texas under the mentorship of Dr. Jesus Rosales-Ruiz and Dr. Traci Cihon. He completed an experimental research thesis on operant variability, a behavioral phenomenon critical to creativity and problem solving. He also conducted instructional design research on undergraduate education and Dr. Israel Goldiamond’s constructional approach to therapy. Outside of his education interests, Andrew applied Precision Teaching, Behavior Analysis and instructional design principles to his work as a high school hockey coach, resulting in an Ohio State Championship. Andrew enjoys spending his time traveling, reading, and exploring the vegan food scene with his wife, Sarah and spending time with his infant son, Bear. He can often be found hiking, kayaking, swimming, trail running, or generating exploring with his two dogs, Nala and Dr. Furious J. Styles.